In 2004 the company that owns River Park Square contacted Apple Inc. and asked the maker of Mac computers and iPods to open a new store in the downtown Spokane mall. The tech company replied with a curt “No, thanks.” Its Cupertino, Calif., retail managers never gave a reason for the rebuff, said Robert Smith, a spokesperson for River Park Square, owned by Cowles Co., which also owns The Spokesman-Review. Six years later, trendy and cash-flush Apple has decided now is the perfect time to build a retail store in Spokane’s downtown. Taking over the two-story space last used by Eddie Bauer near Main and Wall streets, this will be Apple’s first Inland Northwest store. Spokane retailers say Apple’s arrival is big news. But they’re also asking: What changed since 2004? Did Spokane develop more retail credibility? Or did Apple change its rules for where it builds stores? According to local managers and analysts, the answer is both. Spokane’s downtown has proved itself a solid and robust retail destination, say area business managers. Plus, Apple is now building more stores across the country to capitalize on its brand’s skyrocketing popularity. Thanks to the success of products like the iPad and the iPhone, cities like Spokane are big enough to help the company keep growing, said Apple analyst Charles Wolf, based in New York with Needham & Co.
An Apple spokeswoman did not provide answers to questions about its selection of Spokane. 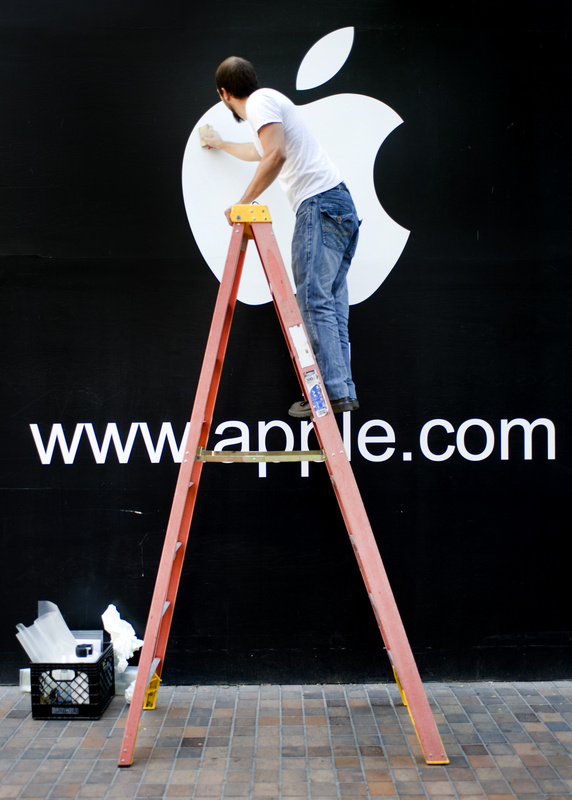 Even after an Apple logo was painted last week on the construction site, spokeswoman Amy Barney said no announcement has been made about the Spokane store. City officials have said the store is likely to open in September or October. Apple has roughly 300 stores worldwide, with about 70 outside the U.S.
Retail stores account for about 16 percent of Apple’s revenue. Back in May, Apple overtook Microsoft in overall stock market value, becoming the world’s most valuable tech company. When picking new stores, Apple looks less at total population than two age groups of consumers, said Trip Chowdry, managing director of Global Equities Research and an Apple analyst, based in San Francisco. “Apple looks at the markets it goes into and especially wants two characteristics,” Chowdry said. One is college-age computer and gadget-users, because those people become advocates for the brand, he said. Spokane qualifies on that account, having roughly 21,000 full-time college students within 20 miles of downtown. “For Apple, Spokane is then a college town,” he said. The other target group that Spokane provides is older, graying customers, Chowdry said. Those are retired or near-retirement buyers who respond to ads that describe Apple products as simpler to use, safer than PCs and more reliable, Chowdry said. Retail stores play a large role in reaching that older demographic, he added. Unlike other large consumer electronics retailers, Apple’s stores are more than places to examine products. “It’s about hands-on training and very strong customer support,” Chowdry said. That emphasis on customer satisfaction is a major strength Apple has over Microsoft, he said. Microsoft’s products are sold in stores with sales teams who don’t have the depth of knowledge about software and hardware that Apple’s store staffs do, Chowdry said. Its stores maintain that same feeling: sleek, modern and uncluttered in layout, with plenty of room to move around in, he said. Apple’s flagship stores are monuments to glass and stainless steel. These high-profile spaces feature all-glass walls and stainless steel facades. Many of its smaller stores use backlit wall graphics, stone floors and all-wood product tables and shelves. Its Fifth Avenue store in Manhattan has attracted scads of publicity, resembling an all-glass structure in the shape of a cube. Wolf, who tracks Apple and other consumer electronics firms, suggested Apple’s foray into Spokane is more about the tech giant expanding into steady retail markets, especially as the company continues taking customers away from Microsoft. “I suspect Apple is anxious to locate in Spokane because it has no stores between Portland and Seattle and Salt Lake City,” he said. “And Spokane easily has a large enough population to support a store. “So it’s probably adding stores in locations that previously did not appear attractive,” Wolf said. The Spokane Apple store will be its sixth in Washington. It has no stores in Idaho, Montana or Wyoming. Spokane-area retailers agree that the addition of Apple is a major win for the downtown core. “Apple is a fantastic brand and we’re very excited they’re moving into downtown,” said Murray Huppin, president of Huppin’s Hi-Fi, Photo and Video, which has a retail electronics store several blocks away from the Apple location. “Wherever they come in, they attract visitors,” Huppin noted. The one Spokane retailer who probably has the most to lose is J.D. Strong, owner of Strong Solutions, who opened a full-service Apple retail shop on East Sprague in summer 2009. He won’t be able to compete on cost with the downtown store, since Apple sets the prices for nearly all its products. But Strong said he expects the new store will have benefits down the line. Over time the appeal of Apple products will increase, and Strong said he believes his store will do just fine. “Spokane has that desire for quality, personal service, and we provide that,” he said, noting that Strong Technologies does Apple repairs in-store, while Apple’s own stores ship a large number of repair jobs to a central hub. “We also provide on-site repairs,” along with consulting services for companies that need help in managing a group of new computers in a small or midsized business, he said.